Featuring free WiFi, Atlantis Hotel boasts a city-centre location, 1 km from the main port of Piraeus and Pasalimani bay. The Archaeological Museum of Piraeus is 300 metres away while the main historical monuments of Athens are 10 km away. Each air-conditioned room includes a TV and marble floors. The bathroom comes with a shower. Located a 10-minute walk from the ferry terminals of Piraeus Port, Atlantis Hotel enjoys great connection to the islands and to Athens' attractions. A mini market is at 150 metres, while a cafe and a restaurant are at 50 metres. A bus stop for the airport bus (X96) is at 600 metres and Eleftherios Venizelos Airport is 30 km away. 12 Evaggelistrias & 1 Notara St.
With a stay at Piraeus Port Hotel, you'll be centrally located in Piraeus, a 5-minute drive from Port of Piraeus and 14 minutes from Acropolis. This hotel is 6 mi (9.6 km) from Acropolis Museum and 6.6 mi (10.6 km) from Syntagma Square. A stay at Piraeus Dream places you in the heart of Piraeus, within a 15-minute walk of Port of Piraeus and Piraeus Flea Market. This hotel is 6.5 mi (10.4 km) from Acropolis Museum and 6.6 mi (10.7 km) from Acropolis. Enjoy Mediterranean cuisine at Incognito, a restaurant which features a bar, or stay in and take advantage of the room service (during limited hours). Buffet breakfasts are available daily for a fee. With a stay at Efplias Hotel Apartments and Suites, you'll be centrally located in Piraeus, within a 10-minute drive of Port of Piraeus and Archaeological Museum of Piraeus. This 4-star aparthotel is 7 mi (11.3 km) from Acropolis Museum and 7.2 mi (11.5 km) from Acropolis. Located in the centre of Piraeus, 200 metres from the main port, Central Railway Station, metro station, suburban railway station, bus stops and shops, the family-run Niki Hotel offers elegant rooms with free Wi-Fi. A hot tub and 24-hours room service are featured. 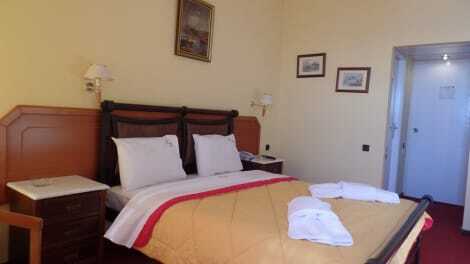 The hotel offers air-conditioned, soundproofed rooms and suites with TV and radio. Extra long beds are featured in all Hotel Niki’s rooms. Daily cleaning service is provided. Guests can order continental breakfast in their room. The bar offers snacks and drinks throughout the day. A 24-hour reception service is available. The airport bus line as well as lines connecting to Athens’ city centre run through the bus station located 500 metres from the hotel. Private parking is possible across Hotel Niki Piraeus, upon charge. The beach is a 17-minutes walk away. Satisfy your appetite at the hotel's coffee shop/café, or stay in and take advantage of the room service (during limited hours). Wrap up your day with a drink at the bar/lounge. Continental breakfasts are available daily for a fee. Located in Piraeus, Anita Hotel is within a 15-minute drive of Port of Piraeus and Temple of Olympian Zeus. This hotel is 6.2 mi (10 km) from Acropolis Museum and 6.3 mi (10.2 km) from Acropolis. lastminute.com has a fantastic range of hotels in Piraeus, with everything from cheap hotels to luxurious five star accommodation available. We like to live up to our last minute name so remember you can book any one of our excellent Piraeus hotels up until midnight and stay the same night.